This is not a sponsored post. However, should you click on one of our amazon links and make a purchase (any purchase), we will receive a small (very small) commission. This is at no additional cost to you! If you’ve visited Nothing if Not Intentional before, you may know that we have two girls–ages one and three. It’s easy to buy for the three-year-old. I can think of a million things that would make her day–an airplane toy, a kite, rain boots, finger paint, bubble gum, or permission to watch more Winnie the Pooh. But the baby? We have a hard time thinking of what to give her! She certainly doesn’t NEED anything. And, in her mind, the best gift would probably be unrestricted access to applesauce pouches and cheese sticks. In case there are others out there like me who need a shower, first birthday, or Christmas gift for babies and young toddlers, here are my favorite suggestions–all cheap, free, unique, and/or easy-to-make! Just because something is practical doesn’t mean it can’t be fun, cute, or a lifesaver for mom and dad! Here are our favorite out-of-the-ordinary baby items. Wubbanub–our baby doesn’t have a lovey. She has a Wubbanub. Actually, she has TWO Wubbanubs. She puts one in her mouth and holds the other in her hand. 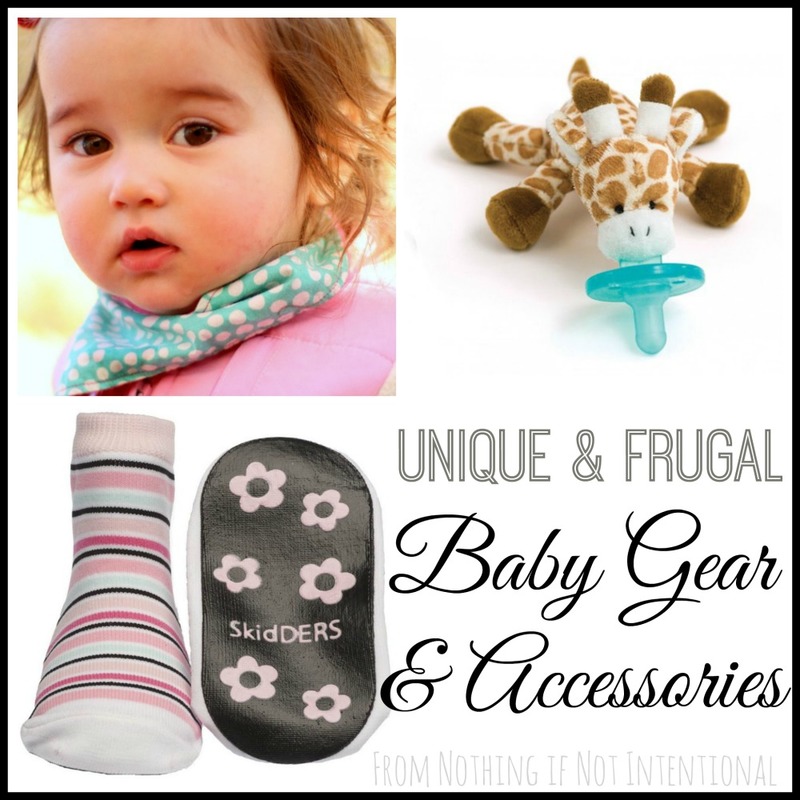 If your baby likes the hospital “Soothie” pacifiers, then consider a Wubbanub. As far as pacifiers go, Wubbanubs are not cheap. But they definitely make for unique gifts. Selling point for me: most babies can find them and put them back in their mouths sooner than they can regular pacifiers, which means more sleep for everyone. Drool Bibs–our baby is a drooler. If there’s a tooth on the way, she’ll start soaking her shirts about a month or two before it pops through. One of our friends was sweet enough to give her some of these drool bibs for her first birthday. 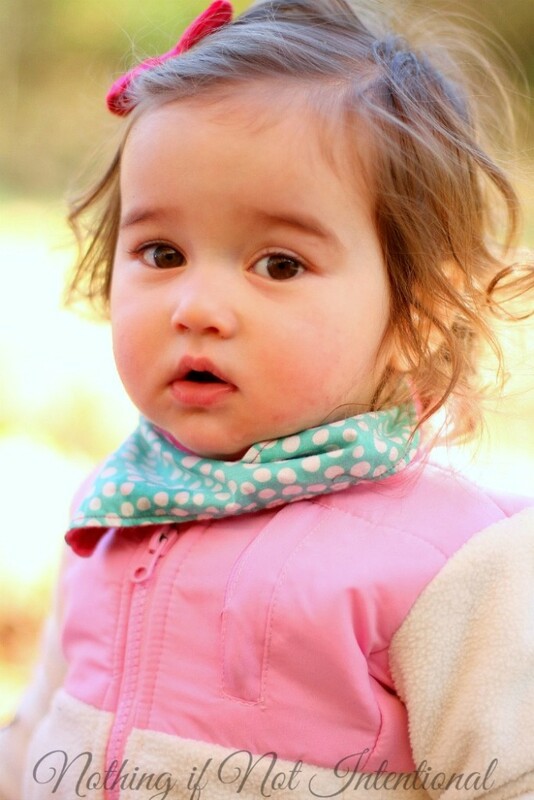 You can find lots of adorable prints and styles on Etsy (I <3 Etsy), or you can make your own drool bibs. Skidders Socks–My little one won’t wear socks around the house. I put them on her, and she immediately leans over and says, “Shoes? Socks?” and pulls them off. These Skidders Baby Grippers socks, however, stay on her feet, keep her warm in winter, and prevent her from sliding across our hardwood floor. Win, win, win. Bows–did you see the discussion on the Nothing if Not Intentional facebook page about my friend who thinks that babies either have time to grow hair or teeth–not both? Well, my baby (15-months) has just six teeth but so much hair that bows and hair ties are more than cute accessories. They’re essential if I expect her to be able to see well enough to not run into walls. I have an entire pinterest board filled with bow tutorials and hair accessories. For very young babies (and their tired Mamas! ), I recommend making a Moby-like wrap. And by “making” I mean cutting a piece of stretchy fabric to the right length. (See instructions in the link.) It’ll cost you about $5. Anything that will shake, rattle, buzz, hum, or whirl can help babies with rhythm, self expression, and hand-eye coordination. One of our neighbors has this drum, and it’s always a HUGE hit with the kids during playdates. We love Melissa and Doug toys, so we picked up this instrument set to give to our 15-month-old at Christmas. 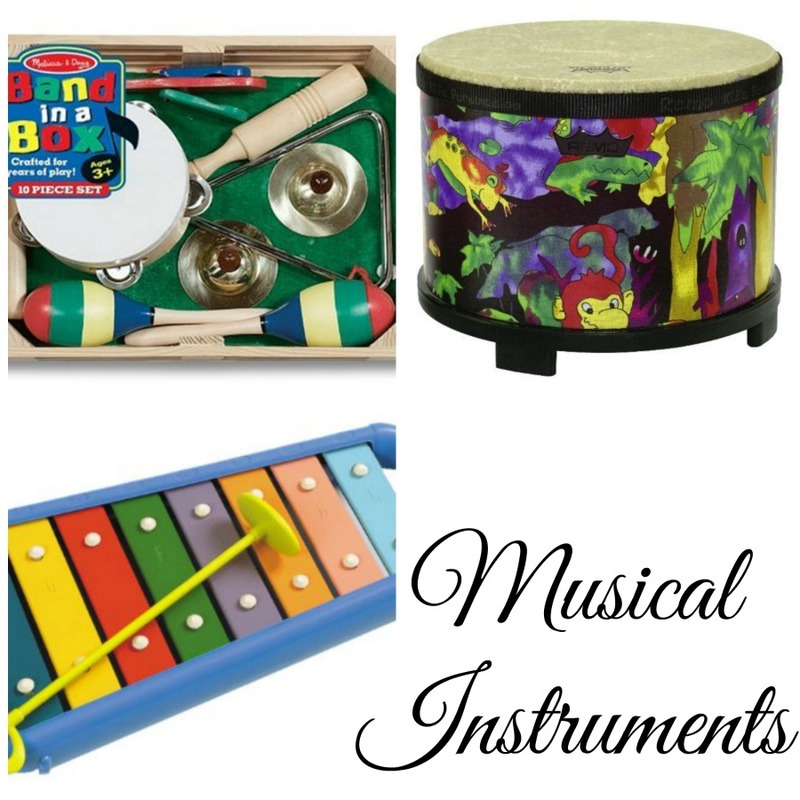 Hohner Kids has a line of musical instruments that are free of BPA, lead, and phthalates. Want to make your own? Here are some ideas for homemade drums from Fantastic Fun and Learning. Wouldn’t it be fun for an older sibling to make one of these as a gift for the baby? Some of our friends made these wooden tree blocks for our baby for her first birthday. Aren’t they the coolest thing ever? They swear they were easy to make, but I’m forever grateful that they shared their craftiness with us! 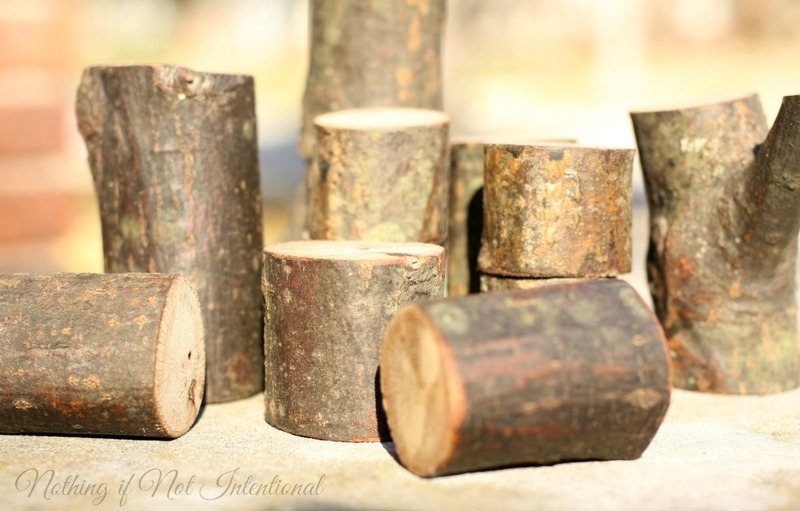 You can follow this tutorial from An Everyday Story to make your own tree blocks or this one to make your own nature blocks from Stir the Wonder to make your own set. Or you can buy a set through Etsy. These dyed rainbow wooden blocks from Fun at Home with Kids are eye-catching and (seemingly) easy to make as well! Has anyone else noticed that right around the time a baby turns one, they become obsessed with balls? Our baby likes to throw, roll, chase after, chew on, and point out (ball, ball, BALLLLLLL!!!) every ball in sight. Some babies just NEED to climb. Rather than watching my little one climb up (and fall off) the kitchen step stool, I redirect her to this slide. Bonus: in the summer, you can take it outside, turn on the hose, and turn it into a water slide. Moms need exercise too! Why not make one of your gifts a dance party date? Your favorite pandora station will work just fine, or CDs with toddler favorites (like this , this, or this) would be great to keep in the car or a child’s bedroom. There’s nothing wrong with the simple classics. Babies and toddlers love watching and chasing bubbles! For parties and play dates, we love our bubble machine. 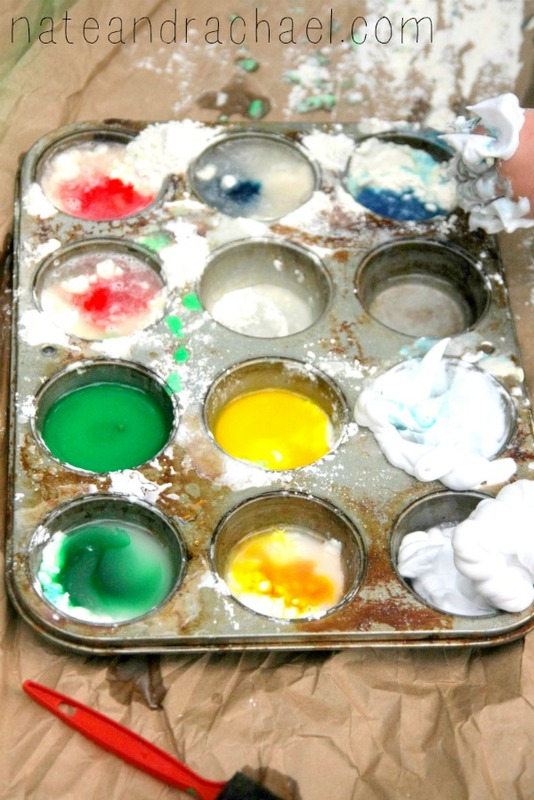 Another classic idea–playdough! Why not try making your own nutmeg and cinnamon dough using this recipe from My Nearest and Dearest? These free printable roads from Picklebums would be a great addition to your tot’s car collection! 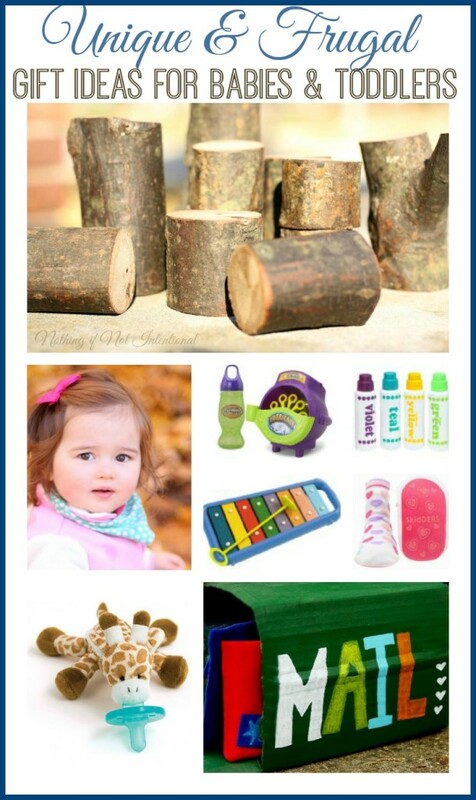 Want to make a great gift for baby using items from the recycling bin? Check out this clothespin drop game from I Can Teach My Child, the homemade texture cards we made for our baby, or these texture blocks from Fireflies and Mudpies. Another free gift would be to collect items found throughout your home and put together a heuristic play treasure box. In almost all of our messy-play pictures, you’ll see my girls wearing these long-sleeve bibs/art smocks from ikea. They come in packs of two and are machine washable. Both of my girls LOVE to paint. We no longer buy finger paint from the store, because I’ve found it’s cheaper and more convenient to make our own. Check out our list of 11 Super-Simple Homemade Paint Recipes. Seven of them are completely edible, which means they’re perfectly safe for babies! 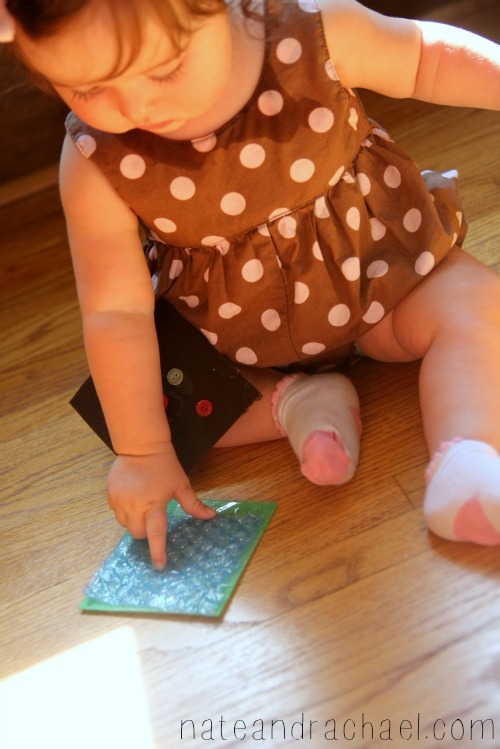 Wooden stamps are great for babies and young toddlers, because they are big enough to grip easily. Mama Papa Bubba blog has a tutorial for how to make your own shape stamp with a wooden block and Twodaloo can tell you how to make your own tree block stamps. However, Melissa and Doug’s stamp sets are very modestly priced if you’d prefer to buy instead of build. Also, I hate to brag, but my baby is a whiz with the dot markers. Can you make a living by making art with bingo markers? If so, it may be a viable career choice for her. You can often find these at the dollar stores or, of course, you can buy a set through Amazon. At some point, every parent should try melting and reshaping crayons. At our house, we’re obsessed with airplanes. 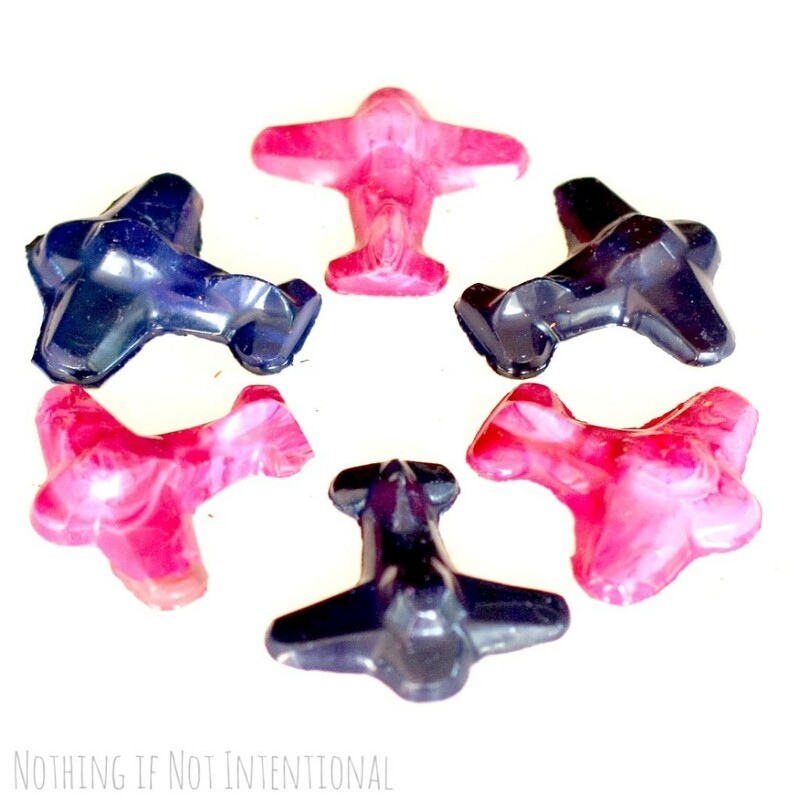 Check out our tutorial for how to make your own airplane crayons. Our girls have been coloring with these for the past few months. I think they would make great gifts for little toddler friends. We used them as favors for our three-year-old’s airplane birthday party. 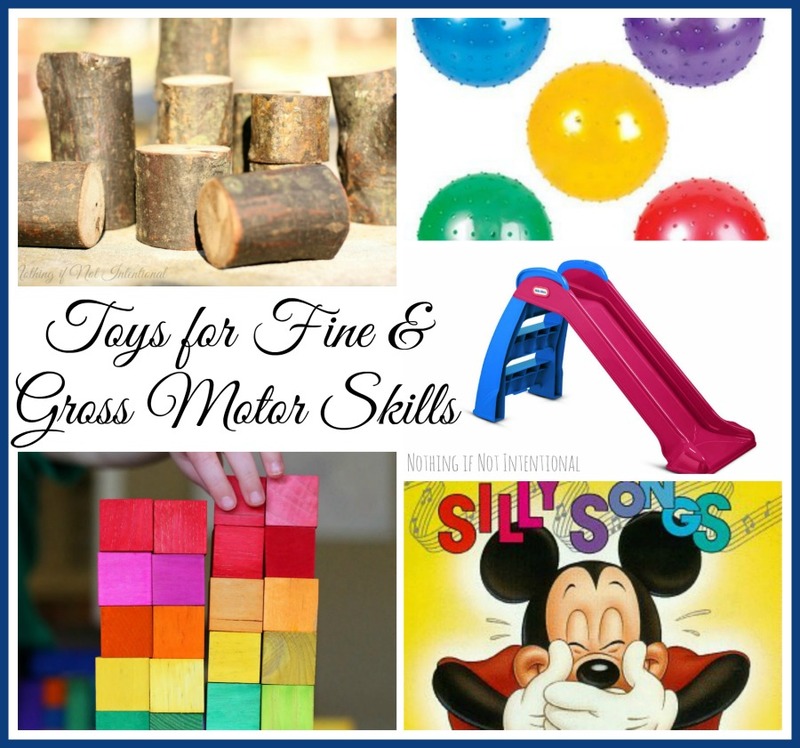 Babies, like all children, need time and attention more than toys. Free field trips to places like the playground or pet store make great gifts. Similarly, one of our gifts to our girls is buying/renewing our museum membership. When you break down the cost per visit with the pass, it’s a good deal. Braving the zoo? 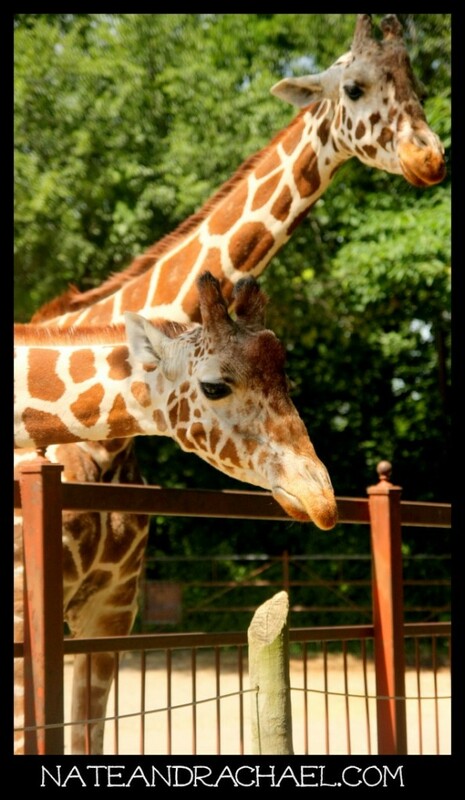 Before you go, read our zoo tips! For more ideas, check out this list of experience gifts from Stir the Wonder. Technically, I suppose it should be pre-reading fun. I don’t know about your baby, but my 15-month-old has yet to master the art of letter sounds and phonics. Heck, at this point we’re lucky if she looks at the book rather than just chewing on it. With that said, here are our favorite literacy-related baby gifts. We made this mailbox last year for our then two-year-old. It has stood the test of time, my friends. 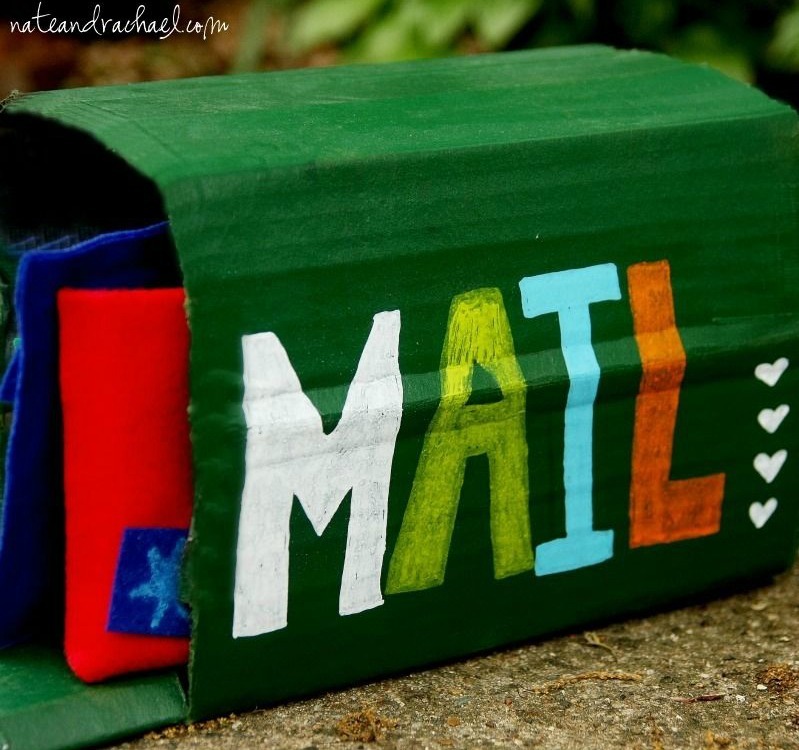 My girls love to pretend to write, read, and mail letters and post cards. It’s simple to make, too. (No sewing required!) However, had I not already made my own, I probably would have ordered this wooden mailbox set. It’s super cute and very affordable! Our youngest is nowhere close to learning her letters, but she is having fun labeling everything as “yellow!” in our magnet letter set. (It’s a total steal, too!) Of course magnets should never be mouthed or swallowed by babies, so please supervise. While we’re talking about letters, oh how I wish Chelsey from Buggy and Buddy would make a set of these felt letters for me and my kiddos. Adorable, right? These homemade picture books (using FREE photo editing software) are the best gifts I’ve ever made for my children. I’m not even joking! They’re cheap (just a few dollars), and so fun to read. If you make one and only one gift for your kids this year, I suggest it be one of these books! And finally, no literacy-related list would be complete without a few book suggestions. 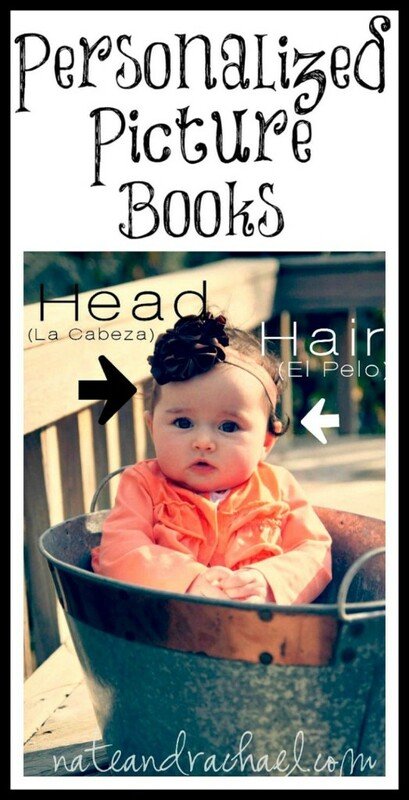 Click on over to check out our list of our favorite baby books. These are the ones that children love to read and the parents don’t mind reading over and over and over and over again. With this list, you should have the babies and young toddlers covered. However, chances are good that you have more people on your gift list than babies! Today I’m teaming up with some of my fellow Kid Bloggers to bring you 50+ gift guides. 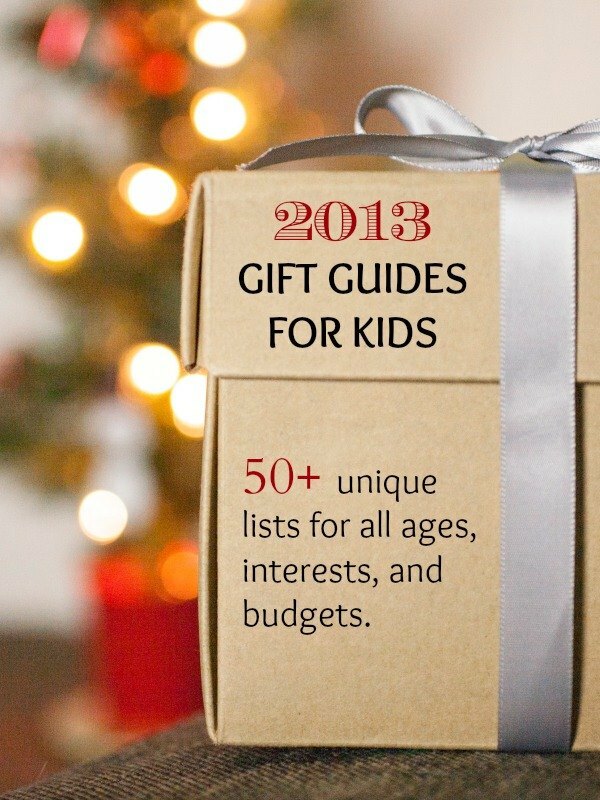 These guides will help you find the perfect gift for all of the kids on your list. For those of you who like to browse on pinterest, check out our gift guide board! *As always, please use discretion and supervise your babies and toddlers as they play. ← Easy, Healthy Pumpkin Muffin Recipe–No Oil!